We are a leading Manufacturer of oem solar water heater, etc type solar water heater, fpc type solar water heating system, etc manifolds - solar heating panels and fpc solar water heaters from Miraj, India. 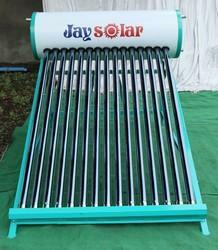 Jaysolar ETC type Solar Water Heater have become very popular recently. They are cheaper, easy to transport and install, maintenance free and withstand hard water. 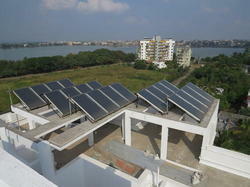 Jay Renewable Energy Private Limited has a state of the art production line for ETC type Solar Water Heating Systems. We provide options for inner tank material such as Galvanized Steel, Stainless steel and Mild steel with Kirloskar Corrocoat. 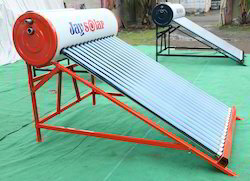 Many reputed companies prefer Jaysolar as their OEM suppliers for ETC type Solar Water Heating Systems. 2030 mm x 1030 mm x 95 mm. ETC manifolds are used to cater to customers who need large volume of hot water every day. They can be used in Thermosiphon mode or Forced circulation mode. Our obtainable variety of FPC Solar Water Heater is sourced from foremost vendors of the business, who are recognized for offering quality proven products. Based on superior technology, these ISI marked flat plate collector is mainly used for meeting the hot water necessities of residential, commercial and industrial sectors. This is the most ordinary solar collector, used in the solar water-heating systems.